It's time to set your missions into motion and actively participate in planetary ascension. We begin our Answering the Clarion Call two-part webinar series this Saturday, August 22. 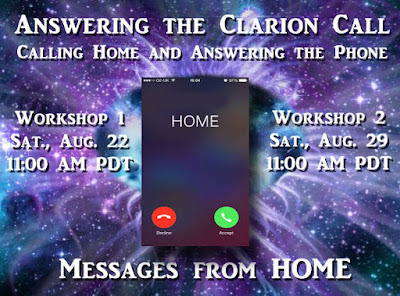 See the full details regarding the hands-on workshops that will guide you through the process of accepting (receiving, channeling, interpreting) and utilizing (sharing with others) this important connection and information you receive from Home. The time for action is NOW! We can follow the instructions embedded in the energy. Wisely enough, a lot of us who came down into our third dimensional vessel slightly remembered what it was like in our other third-dimensional incarnations. So we were able to remember that when we came to Earth, we did not arrive via a ship or a boat or a spacecraft, but we came to Earth on our essence. In other words, we allowed our essence to flow into a physical Earth vessel. Simultaneously, we left a greater percentage of our life stream in our multidimensional bodies and on the higher dimensions. Hence, that higher component of our self can send down messages and communications to assist us as we move through our daily life in which we are wearing a 3D earth vessel. We came into this third-dimensional vessel when a portal opened into our form. Hence, we came in at birth, when there was a near death experience, a high fever, an accident, or an extreme illness. All of these experiences allowed our third-dimensional Earth vessel to open up to higher frequencies of our self. Once the higher frequencies entered our third dimensional vessel from our higher dimensional SELF, they blended with our third-dimensional consciousness. In this manner, we humans are multidimensional beings, right here in the third-dimension. As we fully embrace our higher light, we can remember our purest essence, and we remember that separation is an illusion of the third-dimensional reality. We, our essence, remembers that it is the NOW of returning. This fifth dimension of Gaia is to be filled by the ascending ones who have created a “peak of society” in which great souls, artists and higher-dimensional, multidimensional beings are able to locate their own energy field in that fifth-dimensional essence. That fifth-dimensional frequency of Gaia is what we would call New Earth. It is fifth-dimensional Earth. We have lived on third-dimensional Earth, and we have gone through the wheel of life and death from third to fourth to third to fourth. Now we are ready to graduate into fifth-dimensional Earth and can choose to be amongst those who are beginning to inhabit and enliven that frequency of Gaia. Only a fifth-dimensional beings can inhabit a fifth-dimensional reality. Thus, in order for us to inhabit fifth-dimensional Gaia, we must transmute into our own fifth-dimensional Earth vessel. Many of us have taken incarnations in other times on Gaia, or on other planets, which were similar to what is occurring on Earth now. Whenever a reality is on the up-cycle into peak societies or a down-cycle out of peak societies, there is an opportunity for immense soul growth. Once we return to our fifth, sixth, seventh and higher dimension self, we forget about the time in between the up and the down because we are no longer resonating to the frequency that holds time. Therefore we can remember the NOW in which a new society is booming simultaneously or with the Now in which a society is falling into its own decline. In this manner, we have an intimate experience of the cycle of birth and the cycle of death. We took these Earth vessels because from the perspective of the higher self, we cannot understand an immensely polarized society. Most of us come from Galactic societies in which there has been no conflict since the end of the great galactic war. Therefore, when we come down into a third-dimensional society, it is quite shocking to realize that there is so much conflict and fear without enough Love and Light to balance that darkness. Another difficulty is that in some societies, such as the one that Gaia is moving out of, the beings are often so deeply involved in the act of being human that they don’t realize that other species are sentient. They don’t see the sentience in animals. They don’t see the sentience in plants. Most important they don’t see the sentience of their planet. They know that they are a sentient being, but somehow they don’t realize that the huge globe that they are inhabiting is also sentient. Fortunately, that old illusion is ending as the higher Light is becoming stronger and stronger. Our answer is that the higher Light is infinite. Also, the higher light has no limit and no time or space. We speak of the multidimensional Light that was always there - but just beyond your perception - because your consciousness could not attend to a frequency of reality that was so much higher than the frequency of your consciousness. Before you began to accept the higher light, you only lived in the frequency of third dimensional, physical, illusions. We wish to remind you that every reality is, and always was, within the Now of the One. that YOU, the ascending ones of Gaia, are able to shift into the higher frequency of Earth that you are NOW inhabiting. Now you are preparing to resonate to the fifth-dimensional frequency ring around Gaia, which is the fifth-dimensional version of Earth. We tell all this our beloved ones that you are amazingly opened Portals who are able to daily accept the higher and higher Light into the crown of your head and pull it down through all of your seven chakras to ground this energy in the core of Gaia. In fact when you are in time, it’s because your consciousness has dropped, and you are busily engaged in the experience of being a human. Then when you have “time” to meditate you can go into the NOW of the ONE and open your Portal. 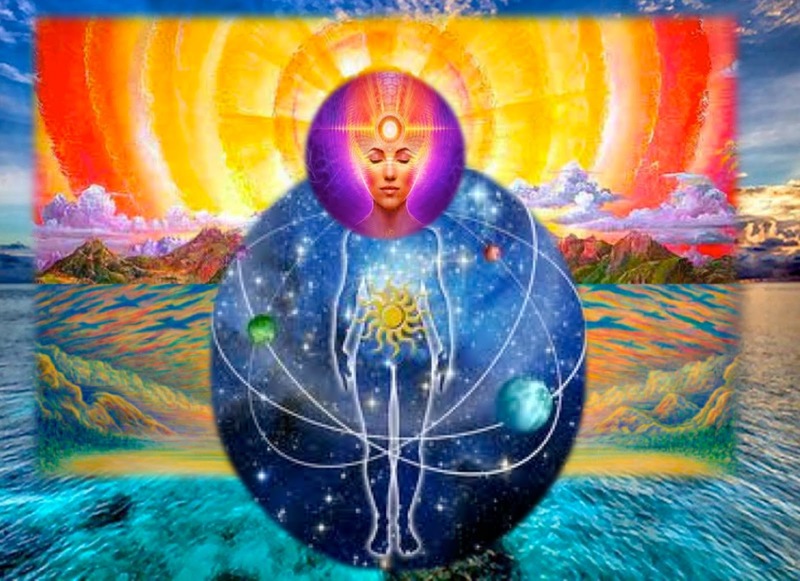 When you open your portal, the higher Light comes all the way down through your body and down into the Core of Gaia, anything less than the resonance of your fifth-dimensional self becomes loosened from the illusion of your physical body that you are wearing. At that point you may experience intense emotions, illness or injury. What is actually occurring is that when that higher Light comes in, it loosens up any blockages that you have inside of your body that are limiting your ability to fully expand your consciousness into the fifth-dimension and beyond. Please remember these are not feelings to be had but feelings to be released. We remind you all, our dear Ascending One that letting go of that which is over allows you to deeply embrace that which is beginning. We, the Arcturians, will return with part 2 of this message. two-way system of communication with Home. Join us as we actively answer the clarion call in a personal and unified way! A 2-Part Webinar Series with Suzanne Lie, Ph.D. and Shawnna Donop, M.B.A. Yes, thank you, Sue, the Arcturians, Ground Crew, and especially, thank you, Gaia. Love, A. Thank you so much. I have been going through these ascension steps, epiphanies and clearings for many years now. The information and guidance I recieve is spot on with your channeling. Multidimensional truth is real! Be the light in someone's life.